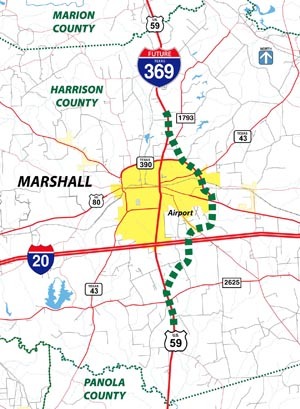 More than 200 members of the public participated in a recent open house in Marshall to ask questions and get a look at a proposed route option for the I-69 system to run through Harrison County in Northeast Texas. The public formum was hosted by the I-69 System (1-369) Harrison County/Marshall Working Group and the Texas Department of Transportation (TxDOT). Following a bottom-up planning process established by TxDOT over the past few years, the 15-member citizen working group from the community reviewed ideas and is seeking citizen consensus on potential routes for Interstate 369 to flow through or around Marshall and to interconnect with Interstate 20 which runs east-west at the city’s southern edge. The working group is chaired by Harrison County Judge Hugh Taylor who is also a board member of the Alliance for I-69 Texas. The working group is leading the process in conjunction with a route study being coordinated by TxDOT. Ultimately the route study and the working group’s efforts will result in the identification of an interstate route option that will then be studied in detail as part of the environmental clearance process. The public is being given full opportunity to comment on all route options considered. This initial route study is expected to be wrapped up by the end of the year and the full environmental process could take two to three years. The working group has identified a route around the east side of Marshall that they feel will best serve the region. Flowing south on US 59, the proposed route would incorporate a section of Loop 390 before swinging south of the Marshall Airport before crossing Interstate 20 and winding back to the existing US 59 alignment south of the city (see map at right). Because of highway funding constraints it is likely that the proposed loop option would be built over time as a series of construction projects that would each improve traffic flow and safety and would eventually connected to new freeway sections extending north and south from Marshall. The Harrison County/Marshall Route Study Working Group members include Judge Taylor; State Representative Chris Paddie; Marshall Mayor Ed Smith; Leslie Chambers, Marshall Economic Development Corp.; Russ Collier, Good Shepherd Medical Center; Charley Ettinger, Sabine Mine; James Greer, Harrison County Commissioner; J.C. Hughes, Marshall Public Works; John Paul Jones, Harrison County; Jerri Medrano, City of Hallsville; Jesse Moore, City of Waskom; Leo Morris, At Large; Haywood Strickland, Wiley College; Marc Smith, Marshall School District; and Connie Ware, Marshall Area Chamber of Commerce. The working group’s efforts have been endorsed by the East Texas Rural Planning Organization, a group formed by the East Texas Council of Governments and comprised of 14 county judges and TxDOT engineers. That group is assisting TxDOT in prioritizing transportation projects in the region. A decision was made in 2013 that the section of the I-69 system from Texarkana to Tenaha, including Harrison County, will be numbered as Interstate 369. The first section in Texarkana was signed as I-369 and added to the Interstate Highway System in 2013. The Texas Transportation Commission received a briefing on the I-69/I-369 Marshall Route Study during a regular December commission meeting in Austin. Judge Taylor thanked the TxDOT commission and staff for moving the planning effort forward. James Koch, transportation planning and programming division director for TxDOT, gave an overview of the working group’s efforts, noting that more than 1,400 individuals have been reached directly through the outreach activities that have been conducted to gather public opinion and inform the public of the group’s progress. “This number does not include those who viewed the ongoing displays, social media posts, or the webpage,” Koch said. He noted the successful open house held in October. “The event provided an opportunity for the public to gather information on the route study, working group activities and the working group interstate route option preliminary recommendations,” Koch said. He said the online survey, following the open house, garnered 105 responses. “Over 50 percent ‘strongly agreed’ with the preliminary Interstate route option recommendation moving forward into the environmental process for further study,” he said. “Additionally, about 18 percent ‘agreed’ which makes those in agreement totaling nearly 70 percent. Koch said a total of 122 written comments were received through this public outreach effort and all comments were considered in the study and will continue to be considered during the environmental process. “Written comments from the public outreach activities expressed concerns about the northern and southern tie-in points, moving east, and the no-build alternative,” Koch said. “The working group concluded that these concerns will be considered in the future environmental studies,” Koch said. “Additionally, the working group was in agreement that going west through the mining areas would be difficult because of ground settlement, making it an unsuitable location to construct a roadway. 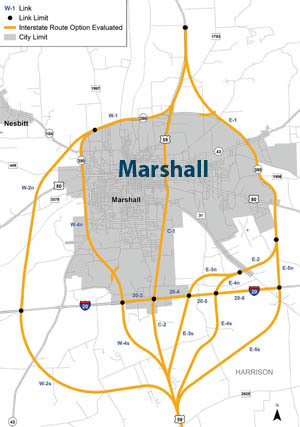 He said it was also reiterated that moving the route option farther east may pose a financial strain on the city of Marshall to provide utility services for development. “The working group consensus was to carry their Interstate route option preliminary recommendation forward as a final recommendation to be studied in detail as part of the environmental process,” Koch said. “The working group has performed an important function by developing a preliminary Interstate route option recommendation, vetting it with local citizens, and determining a final Interstate route option recommendation,” he said. Koch said the next steps in the project would be to identify funding sources and complete the environmental and schematic design process. “The working group recommendation, combined with public sentiment endorsing the Interstate route option, is evidence that this new location route should be studied in further detail in the environmental process,” said Koch. This is the conceptual route that became the consensus recommentation of a citizen-led Working Group which evaluated 13 potential options to the east and west of Marshall (shown below).